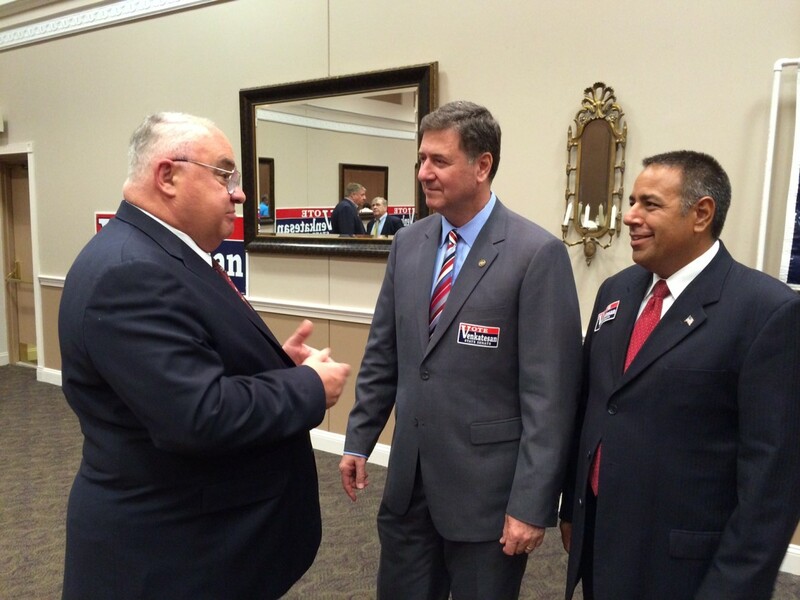 Photo above: From left, GOP comptroller nominee Bill Campbell talks to former Virginia governor George Allen and state Senate candidate Jody Venkatesan. Thursday was not a good day for the last governor of Virginia as Bob McDonnell was found guilty of corruption in a Richmond courtroom. But another former Republican governor of Virginia, George Allen, had a better day of it in Howard County, talking up the candidacy of state Senate hopeful Jody Venkatesan in District 13 and other candidates at a Clarksville ballroom. “There were a lot of folks from Maryland who helped me out” in his successful race for governor of Virginia 20 years ago, Allen told a crowd of about 50, and he was happy to return the favor. Venkatesan is running against Democratic Del. Guy Guzzone for the seat now held by retiring Democratic Sen. Jim Robey. In 2010, Venkatesan lost the Republican primary for the seat that represents much of eastern and southern Howard County, but ran unopposed in June. “In every way, Jody is running on the issues that matter to people,” said Allen, reading from Venkatesan’s palm card. He cited lower gas taxes, “free rain” — eliminating the stormwater charge dubbed the “rain tax” — a health-care website that works, and more bang for your tax dollars. In Maryland, “you have to play tenacious defense against bad ideas,” Allen said. The former governor, who lost a reelection bid for the U.S. Senate in 2006, commented favorably that Venkatesan doesn’t mention his party affiliation on his literature. He said his experience as an auditor would help him root out “fraud, waste and abuse” in state government, and said Guzzone had failed to do that as House chairman of the Joint Audit Committee in Annapolis. “We deserve free rain … Taxing people for rain is an absurdity,” Venkatesan said. He decried the gas tax increases that will automatically go up with inflation. “Gas taxes don’t tax the rich. It’s a regressive tax,” he said. Venkatesan was endorsed last month by the Republican State Leadership Committee’s Future Majority Project, a national GOP effort to encourage more minority candidates. Only one other Republican in Maryland got the group’s endorsement, Anne Arundel County delegate candidate Sid Saab in District 33. Venkatesan is an Indian-American and Army veteran who served in a military intelligence unit. Guzzone has served two terms in the House of Delegates, where he also chairs an appropriations subcommittee, and two terms on the Howard County Council before that. He had looked seriously at running for Howard County executive, and had raised a large campaign war chest until his decision to seek Robey’s seat last year. Late August campaign finance reports show Guzzone had $308,283 cash on hand, after having spent $86,000 this summer largely to support Democratic candidates for Senate in other districts and to pay campaign staff. Venkatesan had just $2,494 cash on hand, with twice that in outstanding bills. Like Venkatesan, Campbell is seriously outgunned by his Democratic opponent, Comptroller Peter Franchot, who had almost $1.5 million in his campaign bank account, while Campbell had $4,833.